I am pleased to report that "The Incident at Tower 37" has, thus far, been submitted to 16 festivals worldwide. Shortly that number will be 18. Producer Daniel and I have been carefully planting these seeds; for the next two weeks or so I will be tuning out and letting them (hopefully) take root. Many thanks to Evan as well for his continued support in all things sound-related. With all this planting I hope to report on many sprouts in the spring, though I have to confess that if it goes really well we're going to be scrambling come March to get exhibition copies where they need to go. Let's hope that's the kind of trouble we encounter. Still trying to secure some audio mastering help with the film. I've got a call out to one shop in NYC but since we don't have something on the books yet I'm open to suggestions. My hope for mid-January is to get the mastering completed, make the final color corrections, and get the transfers made to all the formats that we might need. Have you had any great/awful experiences at particular festivals? Please share. We are going to continue submitting throughout 2009 and would like to target those fests that may be particularly interested in our film. Also, I'm so close to this project I've lost sight of what the outside world might want to hear about it. If you're reading this and would like to see or hear anything from the past three and a half years of production on this film, let me know. And, of course, when I can be sure that posting it online won't impact its festival status I will do that. But for now, I can't offer the film itself. Coming soon to a festival near you, I hope! See you all in 2009. One of the curiosities that comes with living close to Smith College is the periodic screaming that I get to hear. I'm not talking about individuals, nor a little post-party crew making its way back to a car parked near our house. I'm talking about the whole quad lighting up with the shrill and fierce yells of what can only be women in serious pain or pleasure. Since it's the heart of final exam time, it could be a little of both. Anyway, tonight I feel a bit like joining in the chorus. The pleasure part. 'Cause as the shrieks rail out I'm finalizing the festival screener DVD for Tower 37. The last touch for the DVD was the credits, which now seem pretty firmly in place. Tomorrow I should be trying to convert the HD Apple PRORES version into something watchable on a standard def DVD. 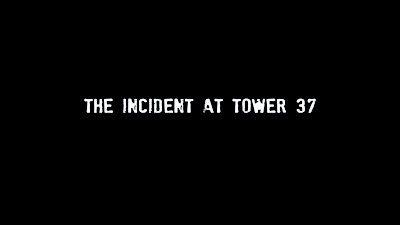 By the way, in the interest of full disclosure, we're going with "The Incident at Tower 37" as the official title. One other interesting thing going on these days (now more on the pain front): I've been following the release of Delgo with serious fascination. Here we have an independent animated feature out of Fathom Studios in Atlanta that took somewhere between 9 and 12 years to make (articles online seem unable to concur on the date the film was begun, ranging from 1996 to 1999 in what I've read). Since I've of course thought a hundred times over about how the Tower 37 production process would scale to a feature (yes, I'm considering it), the fate of Delgo is one I will follow closely. The biggest issue I see is that while Delgo is an independent animated feature, it had a production budget (according to wikipedia, today) of around $40 million. So independent it may be, but it's heavily dependent on a massive box office revenue if it wants to recoup its costs. As of today, that's not looking very likely (boxofficemojo reports a half million on opening weekend, despite it appearing on over 2000 screens). My latest back-of-the-envelope calculations (based on Tower 37) project a production budget an order of magnitude lower than Delgo's for a 90-minute feature of the same quality and complexity of T37. Yes! So, agents and production studios, if you're looking to invest in an independent animated feature that doesn't have to win the lottery at the box office to succeed, you should contact me. Bitfilms is your spot. And if you don't contact me, please don't hang up on me when I try to contact you. Well, the final shot is rendering this weekend. u5_14, the big crowd shot and the one that will keep our linux farm warm for at least the next 24 hours. Probably more. There's still lots to be done even once the expensive layers are rendered (by expensive, I mean the ray traced reflection, refraction, and shadow layers for the thousands of creatures). 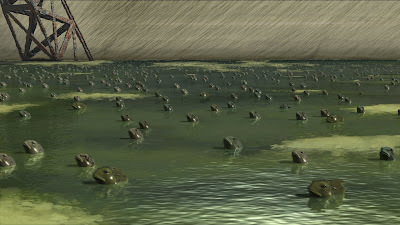 Specifically, I know we need a better terrain treatment in the back, plus, the grime and water will need some re-painting to not overlap with the creatures (and to feel more thoroughly dirty). For this curious, this shot is a combination of 3D rendered elements, 2D paintings projected onto 3D geometry, and pure 2D elements. The camera move is a slow boom down that ends with the framing you see here. Some of the creatures are hand-animated, others are archived RenderMan RIB files from a long tread cycle sequence. Next week we will be doing credits, and then festival submissions will begin the week after. It looks like there will be a wrap party in NYC in February, perhaps one in Los Angeles in March as well. If you're crew, watch for an invite! I also expect that once the first DVD is sent to a festival I'll be having an impromptu wrap party here in Northampton. Or many. This has been a long time coming.